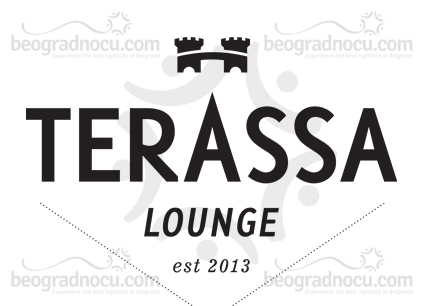 Club Terassa Lounge is completely new place in Belgrade. Terassa Lounge is ideal juncture of lounge bar and nightclub located at Kalemegdan at place of former club Le Folie! During a day club Terassa is ideal place for to chill out with your friends and drinking delicious cocktails in natural shade with beautiful view at river. Club Terassa is opened as Caffe & Bar every day from 9 am until 7 pm. Sunset with priceless view, meditation with deep house sound.. You can describe this only if you experience it, so enjoy in beautiful sunset at Terassa every day in a week. In the evening club Terassa transforms into open air nightclub with exclusive Dj performances with best house sounds and party that lasts until 4 am. Music genre in club Terassa is mostly Deep, Funky & Disco House, Progressive House, Mash Up. Terassa is lounge bar that as evening club accommodates most famous Djs that are making great parties. Ambient is very pleasant and perfectly matches with Kalemegdan. Service is very professional and quality and great entertainment is guaranteed. If you want to experience a ''royal treatment'' you must visit club Terassa. Definitely place without flows. Terassa Lounge is also excellent choice for business meeting and it will impress anyone. Exterior, precisely the terrace is very luxurious, modern design with most beautiful view at river. Most quality and large selection of drinks will delight everyone. Club Terassa is also a place where celebrities like to go out. Athletes, models, singers and many TV personalities are regular guests here. Club Terassa is gathering place of bit elder crew and because of great interest for this piece of heaven you reservations are mandatory. Terassa Lounge is opened every day from 9 am until 3 am. On Friday and Saturday this club is opened until 4 am. In the evening this place is real nightclub, while during a day this is lounge bar.